These colourful, playful discs represent some of Canada’s earliest recordings for children. Some were simply recordings of nursery rhymes or well-known tunes in English and French. Some of the discs would have come as part of a package of items. 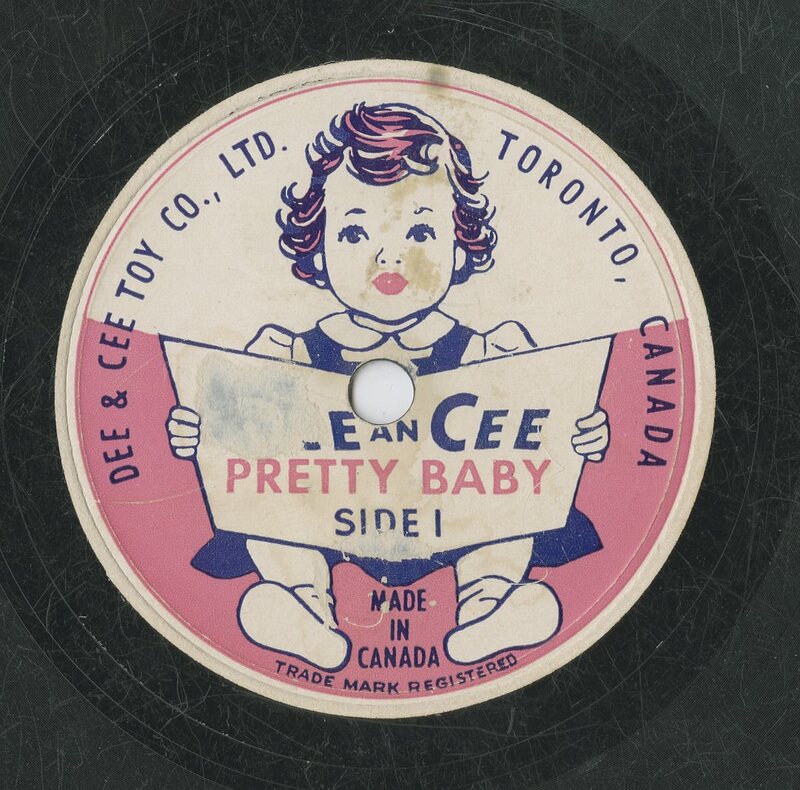 The Dee & Cee Company was a doll manufacturer, rather than a record company, that produced the “Pretty Baby” discs. Dee & Cee presumably included the discs with the sale of some of their dolls, probably as an attempt to increase sales. These beautiful labels captured the attention and entertained many children in the early 20th century when they were released. Following a lengthy commissioning and procurement process, the Peace Tower carillon was installed and inaugurated in 1927. 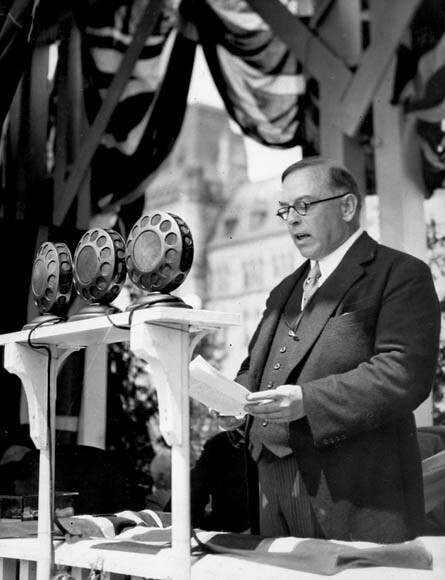 This event was part of the 60th anniversary of Confederation, and the ceremony was the first of its kind to be broadcast across Canada, on radio, so that all Canadians could listen to the address and the bells. Library and Archives Canada (LAC) holds extensive documentation about the carillon, from the “Tender for Tower Clock and Bells by Gillett & Johnson” dated November 27, 1924 (RG11, vol. 2683, file 1575-96D) to ornate invitations and programs for the inauguration (RG11, vol. 2687, file 1575-96, part HA); the latter is shown below. LAC holdings also include programs for the carillon’s well-known summer concert series. 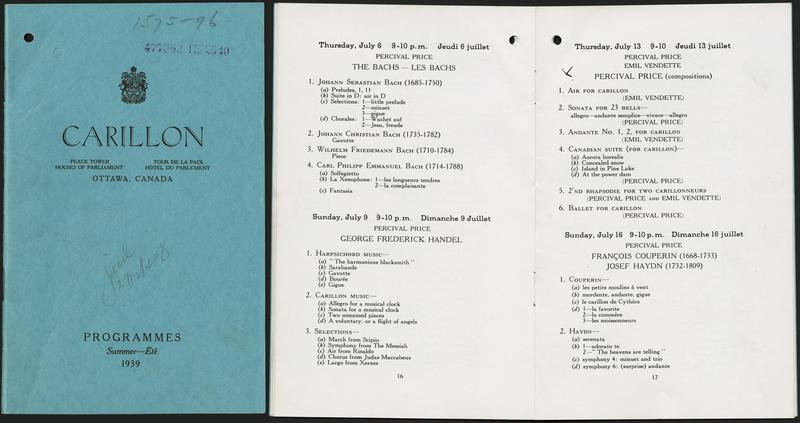 The program booklet for the summer of 1939 has been digitized (RG11, vol. 2688, file 1575-96, part K) and is shown below. 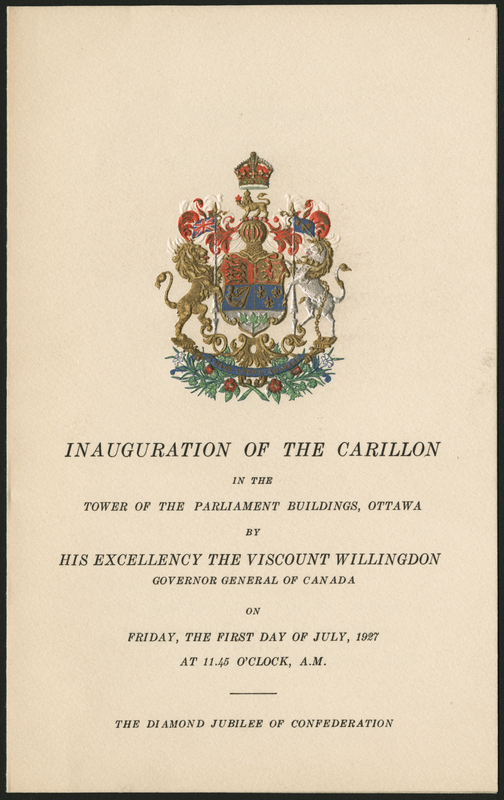 A wide variety of music was played on the carillon for listeners on Parliament Hill, including hymns, folk songs, modern music, patriotic airs and popular songs. You can see today’s program online (formal recitals are given most weekdays). Why not plan a visit to hear the noon concert if you’re in the National Capital Region? If you’re interested in other historical summer programs, take a look at RG11, vol. 2688, file 1575-K for the year 1938, and RG11, vol. 2688, file 1575-L for the years 1940, 1941 and 1942. LAC also holds the private fonds of the first Dominion Carillonneur, Percival Price (MUS 133). The fonds includes sound recordings, textual records and photographs. Two digitized finding aids are available through the fonds-level description to provide access to file-level descriptions for the items. There are no access restrictions on the material in this fonds. The carillon is one of the many treasures on Parliament Hill. I hope you have the opportunity to explore some of them during your summertime travels. If you’re not coming to Ottawa this summer, you could take a tour of your local legislative assembly and learn about the traditions and treasures of your home province! Rebecca Murray is a reference archivist in the Reference Services Division. Henry Burr. Source: Library and Archives Canada music collection, Public Domain. A prolific recording artist, Henry Burr is estimated to have performed in over 12,000 recordings over the course of his life. 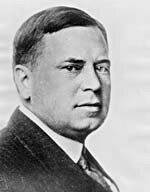 His given name was Harry McClaskey, but he recorded under a wide variety of pseudonyms, the most well known being Henry Burr. Burr regularly performed not only tenor solos, but also in duets, quartets and other ensembles. He often performed alongside Albert Campbell. New additions to the Virtual Gramophone! 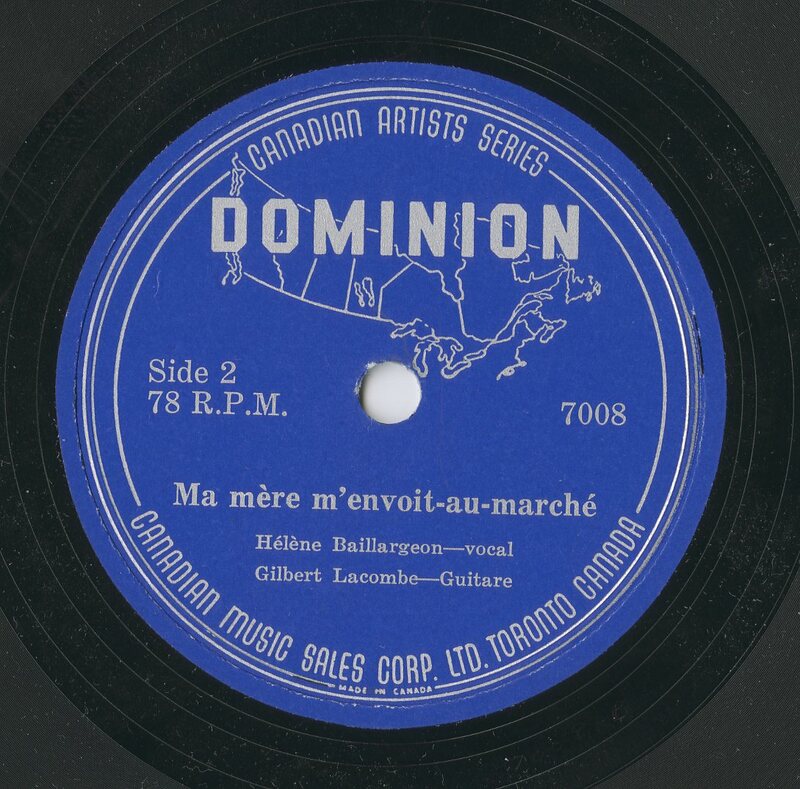 Library and Archives Canada (LAC) is pleased to present a list of newly digitized recordings from our 78-rpm disc collection. These early 20th century recordings include a variety of Canadian musicians, performers, composers and publishers. We will present the new recordings to you in six installments over the next few months. 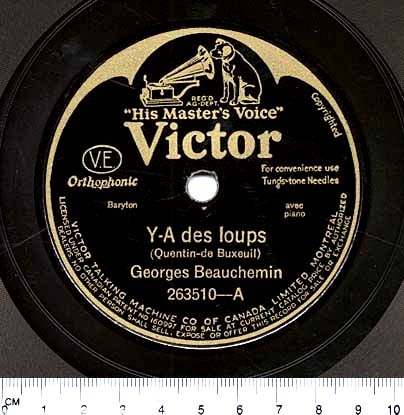 Georges Beauchemin is an interesting early example of the potential that recording technology brought to musicians. Beauchemin possessed a light baritone voice that would not have been suitable for solo stage and operatic roles. However, the new recording technologies allowed musicians with less powerful voices to be recorded and amplified. 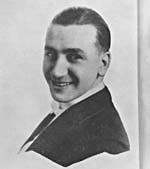 Hector Pellerin was an industrious musician who started out training in piano and organ but quickly moved on to popular music through his work accompanying silent films. He continued to work in various musical capacities before landing his first recording contract at the age of 29. He recorded in both wax cylinder and 78-rpm formats, ultimately making over 140 recordings. One of the fascinating elements of Library and Archive Canada’s (LAC’s) retrospective audio collection is that it captures both the history of Canadian music and the development of sound recording and formats. Audio technologies have developed and changed rapidly over the last century, from wax cylinders to digital. There is a story to be told in the recordings, but also in the formats themselves. LAC’s audio collection goes all the way back to the beginning of recording technology, which was first developed in the late 19th century. The earliest audio format developed for production was the phonograph cylinder. These cylinders were produced in a variety of materials, though all had a similar in design. Example of an Edison brand Blue Amberol cylinder. Cylinders have small grooves etched into the outside, exactly like those of a vinyl disc. The recording can be played by a machine that rotates the cylinder while a needle traces the grooves. The resulting vibrations are then amplified. This YouTube video shows a cylinder in action: note that the needle is fixed and the cylinder moves, unlike a record player where the needle moves and the disc remains fixed. 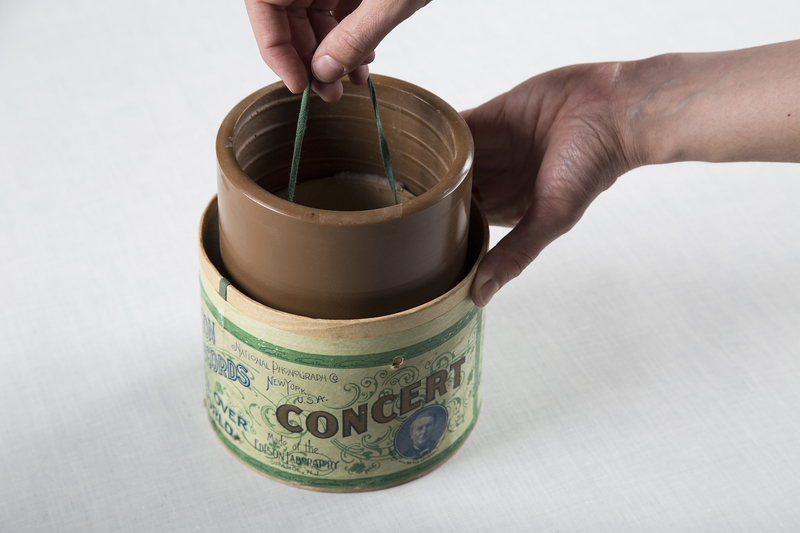 Early cylinders were made from wax, which produced good acoustic results, but were quite fragile. Later cylinders were made from plastic, some tinted different colours to create a distinctive appearance (Roll Back the Years, p. 32). 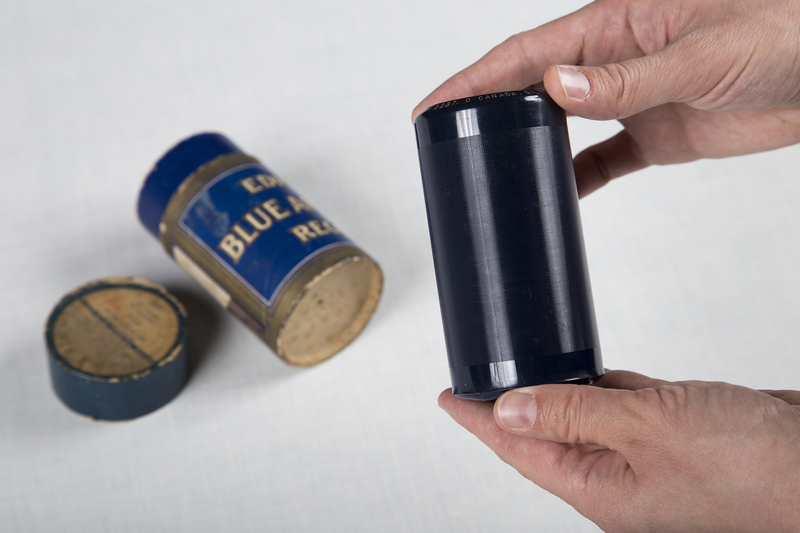 An example of a wax cylinder and its cylindrical cardboard container. While the sound quality produced by cylinders is no match to the digital recordings of today, it is important to remember that, at the time, there were no alternative methods of sound reproduction. Households that bought an Edison machine and cylinders for the first time would not have had any way of playing music in the home other than live performance. It would have been quite the magical experience to go from relying on amateur performance and concerts to having a device that could play music at any time. The small size of the cylinder, and limited surface area, meant that recordings could not be very long; the typical playing time was two or four minutes. This placed limits on the repertoire that could be performed and often influenced the tempo for a selection. 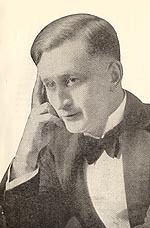 These two examples of “The Holy City” are both performed by Canadian Henry Burr: Version 1 is two minutes long and Version 2 is four minutes long. In both versions, Burr adopts a very elastic tempo, but one that is fairly consistent between the two recordings. In Version 1 he accommodates the smaller cylinder by abbreviating the song and omitting more than half of the music. Much of the poetic narrative is lost in this version, but this is the challenge posed by the cylinder format. A modern wax cylinder player. Margaret Ashburner is a Special Collections librarian (music) in the Published Heritage Branch. The House of Commons Standing Committee on Canadian Heritage reports that the Glenn Gould Foundation is proposing to mount a spectacular year-long “Canada 150 World Tour” that will culminate in an epic Canada Day concert in celebration of Gould and the “musical aspirations of all Canadians”. Gould’s iconic grand piano, the Steinway CD-318, which was removed from display at the National Arts Centre in Ottawa last February while the NAC undergoes renovations will be restored to its display space on Canada Day, 2017. In 2012, the piano and equally iconic concert chair were gifted by Library and Archives Canada to the National Arts Centre, where the piano has begun a new life that includes being played in public performances. A new biography, Glenn Gould: Remix (Dundurn Press) is scheduled for release in June 2017. Library and Archives Canada is the foremost institution for the care and control of Gould’s documentary legacy. In 1984, LAC acquired the contents of the Glenn Gould Fonds, which comprises over 16 thousand items pertaining to the pianist’s personal life and career: official and personal autobiographical documents; personal and professional correspondence; awards and honours; compositions; published and unpublished writings by Gould; writings on Gould in newspapers and periodicals; a collection of books, recordings, and scores annotated by Gould; photographs of Glenn Gould, members of his family, and personalities of the international music world; audiovisual material that includes outtakes from now-legendary recording sessions. The Glenn Gould fonds at Library and Archives Canada is a goldmine for researchers that continues to inspire a huge outpouring of literature, musical happenings, broadcasts, new compositions, and events. Music collections and communications experts at Library and Archives Canada are putting together a substantial podcast designed to make the public aware of the “other side of Glenn Gould”, acknowledging his image as a solo pianist while going far beyond that image. 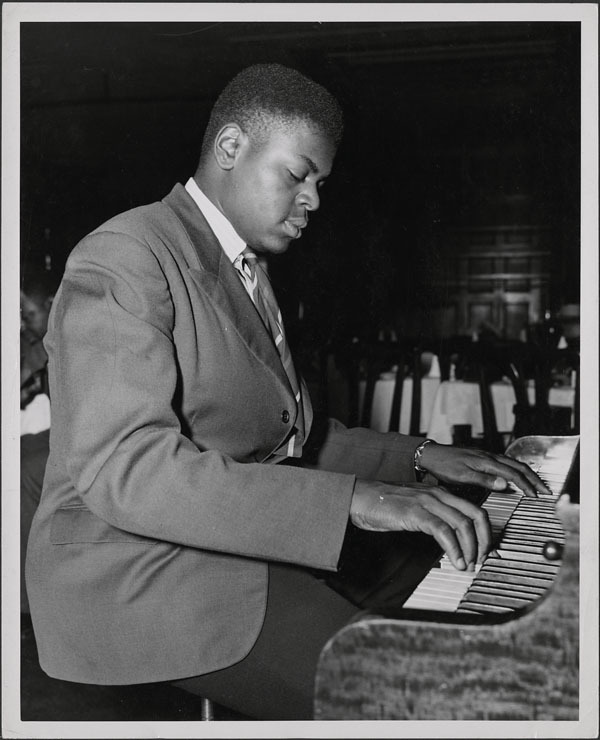 Gould wrote copiously about music and things extra-musical: he performed with other instrumentalists and singers; he composed; produced documentaries, hosted television shows, gave interviews and created new artistic forms. Glenn had […] the kind of daring which accounts for his freshness, the great sense of inquiry which made him suddenly understand Schoenberg and Liszt in the same category, or Purcell and Brahms, or Orlando Gibbons and Petula Clark. He would suddenly bring an unlikely pair of musicians together in some kind of startling comparative essay. […] Here was a man you could really come to love. He was about fifteen years younger than I, I think, but I never felt that he was my junior, in any sense. He was a real peer, in every sense. When he died, l just couldn’t bear it. In preparation for Glenn Gould’s 85th anniversary year in 2017, Library and Archives Canada celebrates the great musician’s eclectic genius, prophetic vision, and compelling quest for meaning through music and art. These were the things that constituted the other side of Glenn Gould. Rachelle Chiasson-Taylor is a Music Archivist in the Private Archives Branch at Library and Archives Canada. 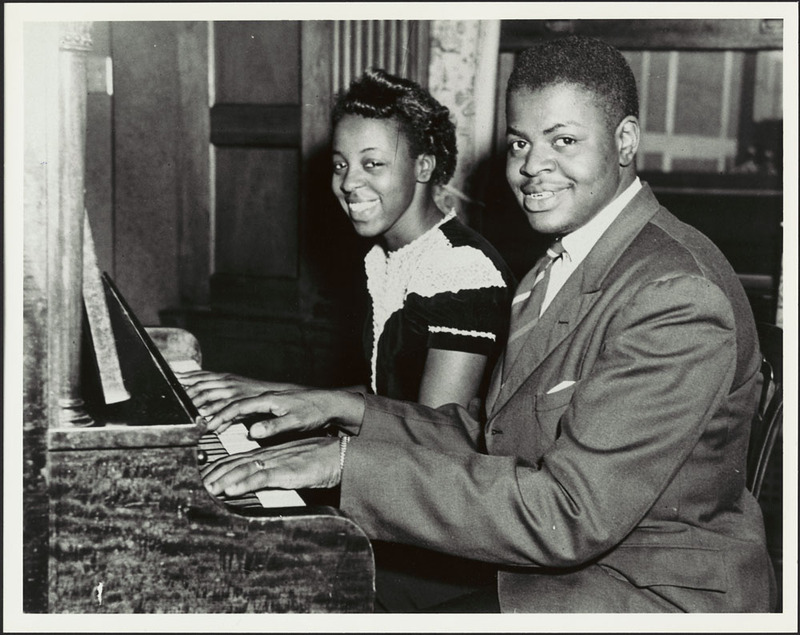 These photographs of Oscar Peterson and his family were taken in 1944. He was in his late teens and already an experienced professional musician. He had been playing regularly with the Johnny Holmes Orchestra since 1942, a popular swing band that played to the dance crowd in and around Montreal. Oscar left the orchestra in 1947 and began a residency at the Alberta Lounge, a club near Windsor Station, leading a trio there for two years. Given the vibrant jazz scene in the city, Oscar had lots of opportunities to play: he performed professionally, played live for CBC Radio broadcasts, attended jam sessions, and met and jammed with visiting musicians performing in town. He earned praise from Count Basie, Woody Herman, Ella Fitzgerald, Coleman Hawkins, Dizzy Gillespie and others. Oscar was based in Canada until 1949 when Norman Granz convinced him to join the “Jazz at the Philharmonic” concert series in Los Angeles. This marked the beginning of his international career. Oscar’s parents were immigrants to Canada. Daniel Peterson, Oscar’s father, was from the British Virgin Islands and worked as a boatswain on a merchant ship. His mother, Kathleen Olivia John, was from St. Kitts, British West Indies, and worked as a cook and housekeeper. They met and married in Montreal, settling in Little Burgundy/St-Henri, a predominately black neighbourhood. Like many men living there, Daniel got a job at Windsor Station as a porter on passenger trains for the Canadian Pacific Railway. With instruction and encouragement from their parents, the Peterson children became accomplished musicians. 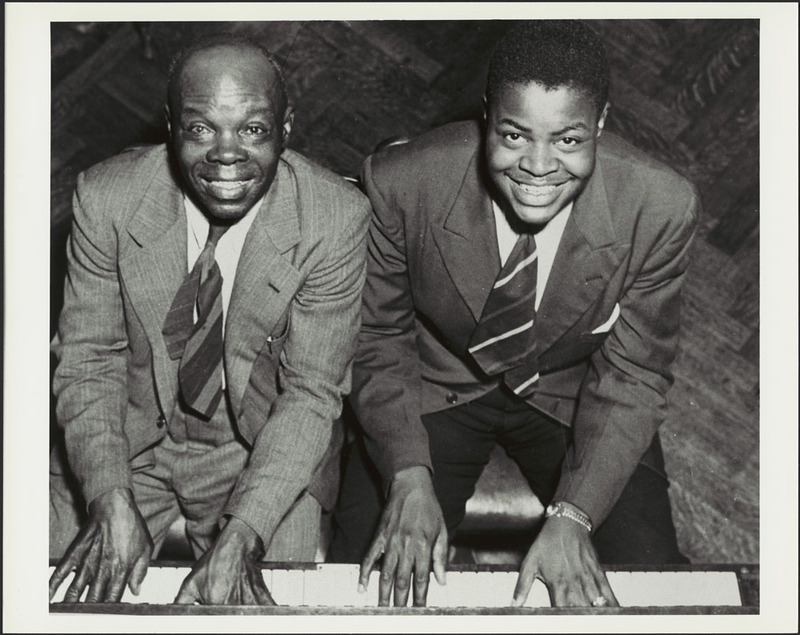 Fred, the eldest child, introduced Oscar to ragtime and jazz when he played it on the family piano. 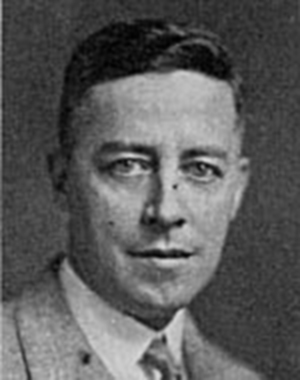 Fred died in the 1930s while still a teenager. Oscar said Fred was the most talented musician of the family. Another brother, Charles, who served with an artillery battery in the Canadian Army during the Second World War, played in the regimental band. 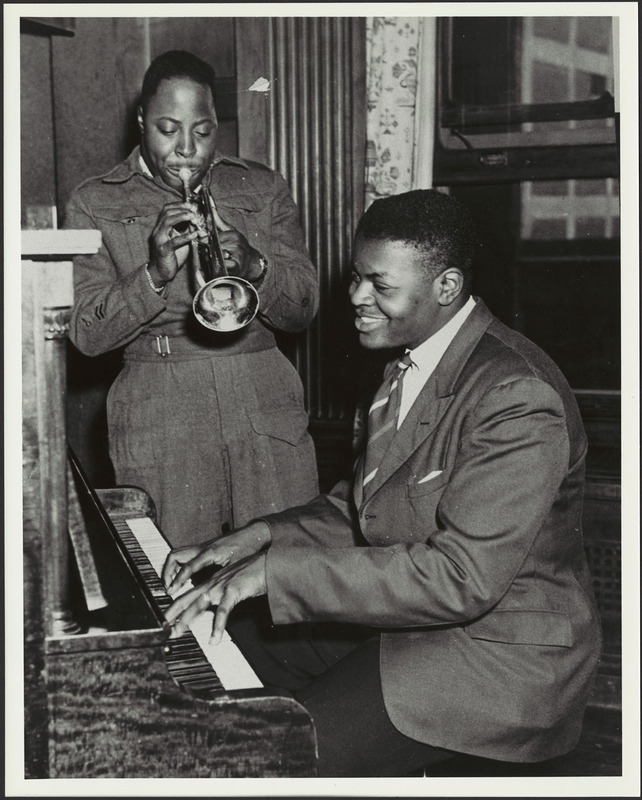 After the war, he continued as a professional trumpet player, doing studio work and performing at various Montreal nightclubs through the 1950s and 1960s. Like his siblings, he also played the piano, but was forced to give it up after suffering an industrial accident while working in a factory in Montreal after the war. Daisy, Oscar’s oldest sister, was also a virtuoso pianist. She earned a degree in music from McGill University and had a lengthy and influential career as a music teacher in Montreal. She was her siblings’ first piano teacher and introduced Oscar to her own piano teacher, Paul de Marky, a concert pianist who played in the Franz Liszt tradition. Daisy taught for many years in Montreal; her students included future jazz musicians Milton Sealey, Oliver Jones, Reg Wilson and Joe Sealy. Library and Archives Canada (LAC) is releasing its latest podcast episode, The Virtual Gramophone: Early Canadian Sound Recordings. 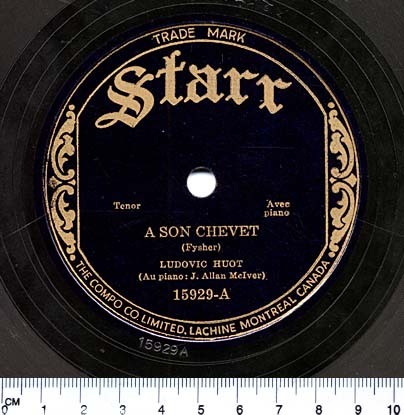 LAC’s Virtual Gramophone is a multimedia website devoted to the early days of Canadian recorded sound, providing an overview of the 78-rpm era in Canada. Gilles Leclerc, Archival Assistant, and Gilles St-Laurent, Head Audio Conservator from LAC join us to explore the Virtual Gramophone website and music collection. They discuss the different aspects of the collection and bring to light some incredible stories about maintaining the collection for future generations. Subscribe to our podcast episodes using RSS or iTunes, or just tune in at: Podcast – Discover Library and Archives Canada: Your History, Your Documentary Heritage.